In terms of effort to enjoyment ratio, Sibayak is easily one of the top volcanoes in Indonesia. Situated above the friendly hill town of Berastagi which is just 2 hours from Medan, the volcano’s crater lies just over an hour’s walk from the nearest road and can therefore be explored by anyone in reasonably good shape. It is one of the most visited mountains in Sumatra and can be climbed from three directions. The most popular route is from the road at Jaranguda just 3km from the town of Berastagi but some people even just allow an extra hour or so (three hours in total) and walk from Berastagi such is the volcano’s proximity to the town itself. The second route is from Semangat Gunung (‘spirit mountain’, also known as Raja Berneh) where there are hot springs (a two-hour hike). This is also a short hike but it’s better to descend this way to make the most of the hot springs after hiking. The third and least popular route starts at Tongkoh on the main Berastagi-Medan road near Air Terjun Panorama. This route is the longest as it involves a trek through jungle to reach the mountain. Allow 4 or 5 hours from the road to the crater. Whichever route you take, it can easily be accomplished in a single day but the earlier you start the better, not least because in good conditions the views are at their best just after sunrise. Unless you’ve climed this volcano before and fancy trying the longer Tongkoh route, we recommend arranging a guide to meet you at your hotel in Berastagi at 4am, charter an angkot to Jaranguda (approximately Rp100,000 which isn’t bad considering the driver has to get out of bed at 3.30am) and hike to the crater rim by 6am. After enjoying the spectacular post-dawn views, you can descend a different way to Semangat Gunung and enjoy the hot springs before chartering another angkot back to Berastagi (approximately Rp 70,000) in time for a late breakfast /early lunch. For a full exploration, allow about 7 hours altogether, which includes transport time and 20 minutes in the hot springs. At your guesthouse in Berastagi, you will probably be told about how dangerous hiking Sibayak can be. The volcano hasn’t erupted for nearly 400 years, but over the years a number of hikers who went without a guide never made it down again. 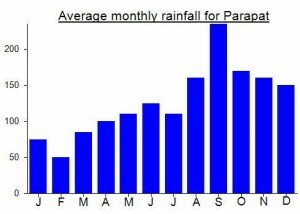 This is more to do with the sheer number of tourists who visit it rather than it being more dangerous than other peaks. However, whilst the crater area is very accessible, certain parts of the mountain range are very, very remote and wild – moreso even than neighbouring Sinabung. The terrain is straightforward for the most part, but if you got lost in bad weather or went off alone you could easily end up on the remote wrong side of the crater. Two professors from a New York university went up Sibayak in 1983 and never returned. Whether they got lost or were the victims of a very rare robbery or wild animal attack remains unknown. Sadly, a German tourist went hiking alone in 2017 and was later found dead in a remote area. So, although there are likely to be lots of other hikers on the volcano, it really is worth paying for a guide rather than going alone. The main crater areas are very popular at weekends with local campers, many of whom have little interest in hiking and bring guitars up with them to play all night! If you want to camp and actually get some sleep, best choose a weekday night when it will be less busy. Otherwise, set off from your hotel in Berastagi before sunrise as detailed above. Assuming you charter an angkot from Berastagi, you will be dropped off on the road that snakes up the side of the volcano near Jaranguda. Follow the road beyond Simpang Tiga (a small warung on the right, 1,625m) to an area of huts where motorbikes can be left (1,785m) and take a left turn cutting up through vegetation and up over the lower sections of the outer rim. Once over the outer rim, the very well-trodden trail leads up through the crater which has the appearance of a rocky, volcanic valley. Ahead of you, the outer rim climbs on your right to reach a narrow impressive little rocky peak known as Puncak Antene (antenna peak). On your left, above a crater lake and vertical cliffs, is the highest point of the actual volcano area (Puncak Tapal Kuda – horseshoe peak). 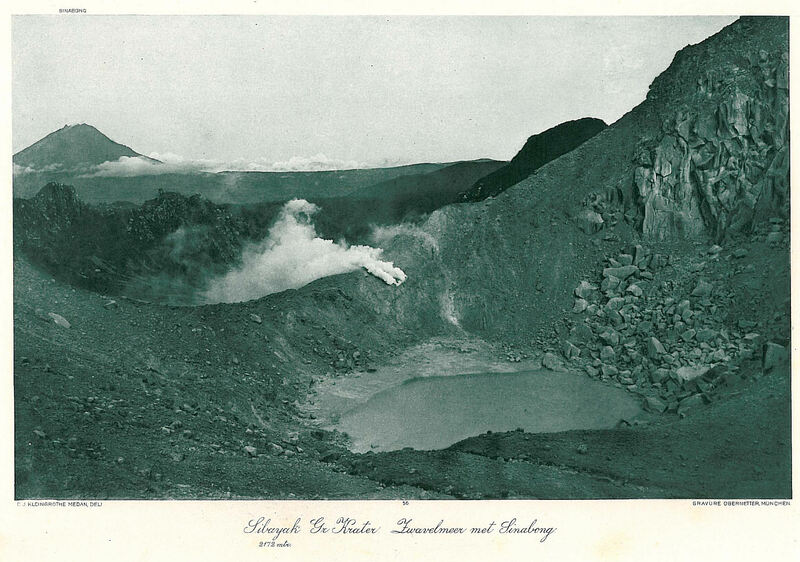 There are many fumaroles down near the crater lake, with one particularly powerful one, and the sound they make as jets of hot gas and steam shoot out is tremendously eerie – especially before dawn breaks. Most regular hikers climb back up onto the outer rim for sunrise. This is indeed a superb viewpoint, looking down towards Berastagi town and the geothermal plant near Semangat Gunung. You can be here in about 90 minutes from Jaranguda or 3 hours from Brastagi. Do take care here as the drop down the side of the volcano is sheer and there are often lots of gas clouds which blow over the outer rim from craters on the actual side of the volcano. As soon as it’s light you will be able to admire the strange beauty of Sibayak and in good weather conditions you should see Sinabung in the distance, which is has been very active recently. After enjoying sunrise on the outer rim, do continue along the outer rim to the steep, narrow little top which marks its highest point. This is Puncak Antene (2,057m) and – whilst cluttered with a few small but unnecessary cement constructions – offers stunning views over the whole volcano area. There used to be an antenna here but apparently a local madman dismantled it to sell it for scrap value! Puncak Antene is the second highest peak of the actual volcano area. The highest peak in this area is Tapal Kuda (2,101m) which is above the sheer cliffs above the crater lake. 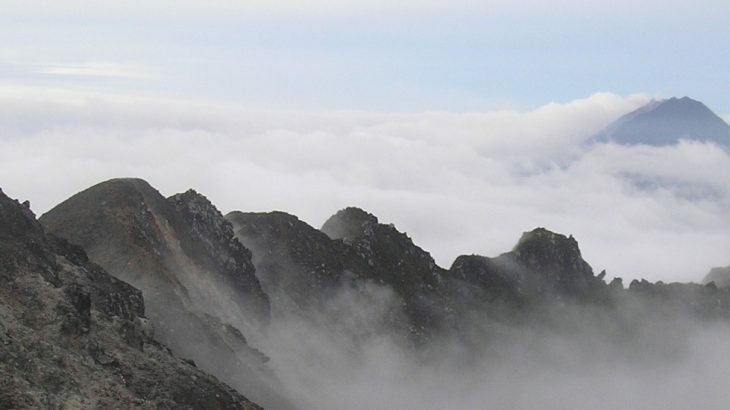 However, the actual highest point of the whole Sibayak mountain area is called Gunung Pintau. It’s a very remote, forested peak (2,212m) hiding behind Tapal Kuda. From Puncak Antene you should be able to see its wild jungle-clad cliffs. The terrain is much more difficult and dangerous than the regular Sibayak trails, but it has been reached on a handful of occasions by student hiking teams on expeditions and there is a trig pillar at the top which was constructed most likely by teams of local men in the Dutch colonial era. But it’s not an easy place to reach – one local hiker died on such an expedition a few years ago – and no regular guide from Berastagi would be able to take you there. For those intent on reaching the true peak of the range, see the comments below for recent contact numbers of the very few locals who know the way. Be aware that there is a section near the top that is exposed, potentially slippery in rain, and is best done safely with a 20-metre long (or more) rope tied to a tree beyond. From the Sibayak crater lip separating the trail up Tapal Kuda and Antene, the Pintau path heads straight north-west and drops down a little between unusual-shaped rocks, before twisting round the back of Tapal Kuda to a small, usually dry, rocky river valley with fumaroles on it. Follow this area up (left) to Pabrik Belerang (‘sulphur factory’, 1,940m) which should be reached within about 40 minutes from Sibayak’s popular crater paths and camping areas. Just 2 minutes from Pabrik Belerang is a swampy lake known as Kuala Putri (‘princess estuary’) which usually has enough water in it for bottles to be filled and then boiled before using for cooking. From Pabrik Belerang, which is effectively the col between Tapal Kuda and Pintau, the path leads up to the right up the side of Pintau, on a slippery but well-defined trail. Views to Kuala Putri and Gunung Sinabung are pleasant in good weather. At an altitude of around 2,050m, the trail enters forest and there are some tricky sections where you need to crawl under spiny pandan trunks and over slippery logs. Landslides are common in this area and, whilst very damaging to local communities, offer some decent panoramas of the surrounding hills. At 2,140m, you reach Lonsor Dua Warna (‘two coloured landlslide’) which was the original source of a deadly leandlisde in 2016 which killed at least 17 people down in the villages near Sibolangit. This is also the spot where a local hiker died several years before after falling. It is an exposed, and slippery, 20 metres or so, but anyone with rock climbing experience and a local guide with a rope should not have any problems here at all, if sufficient care is taken. Views to the right are of Tapal Kuda, Puncak Antene and part of the main Sibayak crater areas. All in all, a lovely viewpoint that very few hikers see. Indeed, it is unlikely that you will meet any other groups up here as Pintau is only visited a handful of times a year. Beyond the tricky section, there are a couple of other minor sections of forest trail which require care and are over slippery rocks (look out for the pitcher plant species Nepenthes spectabilis here – thanks to Alastair Robinson as usual for ID), but just another 10 or 15 minutes and you will find yourself at the forested summit which is crowned with a very well-preserved triangulation pillar, possibly from 1911. It should have taken you around 2 and a half hours to reach here from the main Sibayak crater areas. Allow 5 hours or so for the return trip, including a bit of time for photos and a bit of time for your guide to set up the rope. Essentially, you can summit Pintau after watching the sun rise from Sibayak crater, and be back down in Berastagi by late afternoon. If trying to summit Pintau in a weekend from Jakarta, it may be better to fly to Medan and do Pintau on the Saturday, camp at the crater (try to find a place far from the many other tents) before enjoying the dawn on Sunday and heading back to Medan and flying home. Whilst most people don’t truly bag the highest point of Sibayak (Pintau), we do at least recommend climbing up to Tapal Kuda above the crater lake. Other than on weekends, you will probably have this peak to yourself and it is here that you will be able to appreciate the wild areas on the Pintau side of the mountain. To get to Tapal Kuda from Puncak Antene, drop back down to the crater lake area and follow the trail round to the left of the crater lake and up onto the the side of the cliffs. There are lots of holes in the rocks beneath your feet so do take extra care as you peer over the edge of cliffs back down to the crater lake. The highest point of this peak is a large rock which gives the name to the peak and requires moderate rock climbing skills to reach the top of – if in doubt, don’t bother as the views are good enough from here. After enjoying the views and solitude of the Tapal Kuda peak, it is best to head back towards the antenna peak and from the lowest point of the outer rim opposite the crater lake drop down the other side of the mountain on a trail to Semangat Gunung. It is a steep and short trail over narrow cement blocks (supposedly 2600 of them originally) which leads through forest and impressive bamboo (1,521m) then out at the Pertamina geothermal plant. From the end of the road it is just 5 minutes to the first of many hot spring baths (1,382m). The water is a wonderful temperature and it is only a few thousand rupiah to bathe. Well worth it! Getting back to Berastagi from Semangat Gunung can be done very cheaply – but only if you’re prepared to wait up to 2 hours for the angkots to slowly fill up! It’s much better to arrange ojeks to the main road or just charter an angkot for about Rp 100,000 which will take you back to your hotel for some well-earned food. Getting there: If you arrive at Kuala Namu airport, order a Grabcar, taxi or ojek to take you to Padang Bulan (approx Rp 50,000). From here buses run frequently to Berastagi (2 hours) and will only cost Rp 25,000 or so. You could also take a Grabcar or taxi all the way to Berstagi (Grab approx Rp350,000 in 2018). Accommodation: Plenty of places to stay in Berastagi. Wisma Sibayak is an excellent budget option with good food and friendly staff. It’s near the cabbage monument. The best cafe for food is Cafe Sibayak on the main street. Permits: Entry ticket is a very reasonable Rp10,000 per person (in 2018). Sign the register book at the entrances. Water sources: The water on the volcano is far too sulfurous to drink! Kuala Putri water is fine for boiling before using but very few hikers visit this area. Remember to buy drinks and snacks in Berastagi the night before and take enough bottled water with you. Featured, Sumatera Utara Spesial. permalink. Managed to reach the true summit – Pintau – on Saturday, thanks to Medan-based hiker and excellent guide Bang Arkan. Flew to Medan from Jakarta Halim (always a pleasure when compared to having to get to Soekarno Hatta) with some good dawn views of what must have been Gn Talakmau. Had initially been quoted 600,000 one way from Kuala Namu to Berastagi which seemed pretty ridiculous given the Grabcar quote was around Rp320,000. The car hire website chap said ‘yes but just you wait until you get to the airport and see how many of them want to take you there’. As it turned out, several did, including the amusingly-named Pak Hotbin and several chancers who tried to make me cancel my booking with him so they could take us there instead. No respect for their fellow man! Rp327,ooo to Jaranguda. It did take a while to get up to Berastagi, what with traffic on a Saturday morning and the typical mayhem of a market on a major road at Pancur Batu and all the chaps blowing whistles a little too vigorously. Turned up Jl Deleng SIngkut, which is a couple of kms after the first right turn signposted Sibayak (this is for Semangat Gunung) and joins up with Jl Jaranguda. Finally reached SImpang Tiga warung where we paid for entry tickets and tried to get in touch with our guide (who happened to be at a different Pos Retribusi further down the hill). No signal here (had to walk 2 minutes along the track to the right) but several siamangs calling from nearby trees. Bang Arkan arrived with his mate and off we went, up the road to the car park and then onto the trail proper. We set up tents after just another hour at the main crater area. One fumarole is particularly loud here, but as it would turn out, a blessing in disguise! After setting up camp, we headed off for Pintau. I was a little concerned, having heard of all the stories of people not making it back from the range, getting lost, landslides, and a local dying near the top of Pintau, but it actually turned out to be a fairly reasonable terrain that was easy to follow yet required occasional crawling and real care at times. A couple of pitcher plants near the summit (beyond the tricky, exposed section). After celebrating at the summit pillar on this important yet lesser-known peak, we headed back down to camp via Kuala Putri (which was rather dry although acceptable for emergency). Would be a bit eerie camping on this side where you will most likely not meet another soul, but the other extreme is the case down on the main Sibayak trail where tens and tens of tents full of local teenagers are pitched every weekend. It was cloudy at dusk so our hike towards Puncak Antene was aborted due to near zero chance of a view. Weather generally not bad here in February though, definitely compared to Java and further east. It may seem benign enough but even with a huge fumarole blasting away we had little sleep that night after teenagers with guitars arrived and set up camp just 5 metres away, either totally ignorant of how singsongs at 10pm and 3.30am might piss people off, or else having no regard for others at all. Fair enough – these folk mainly just want to get away from their parents for a while and behave like idiots, shouting and squealing in a way their cultural norms would not allow in villages and towns. No much interest in hiking. Luckily we had some whisky which dulled the senses a little. We got up at 5am (my normal alarm time) and headed up Tapal Kuda. Alas, we were too early by an hour or so for sunrise, being still stuck in Java time and forgetting that it would be a long wait for a North Sumatra dawn. Amazing anyway, as gentle coulds blew over our heads and the nearly full moon shone over Sinabung and lower forest-clad peaks. We could also see the lights of Medan for a while and unlike Puncak Antene which was covered in hundreds of people, Tapal Kuda had only 2 tents on it and less than 30 people for first light. It remained cloudy for the most part, but with occasional glimpses of Sinabung and village lights way down below. After breakfast at camp, we hiked back down to Simpang Tiga in less than an hour. Still a fair few locals hiking up at this time, including a Western tourist and Geleng the famous guide (whose name I had forgotten until it was slightly too late to go chasing after him – if you read this Geleng, ‘hello!’). From Simpang Tiga it is Rp10,000 per person in the angkots back down to Berastagi Tugu (monument in the centre) but you have to wait for 10 people to fill the vehicle up. We couldn’t be bothered with that as it might mean nearly an hour, so we charted an angkot for Rp100,000 total back down there. Once down, I tried to find the place I had a good breakfast several years previously but with no luck. However, we stumbled upon Cafe Sibayak which was perfect – great menu, cheap prices and friendly service. Recognised the chef too, I think. Got a car back down to Medan for a few beers at Tip Top before the slow airport train out to Kuala Namu and a parfectly on time Citilink flight back to Halim. The guy next to me started singing hymns as we were coming in to land and told me I must read Luke 8: 9-15 about 4 different seeds trying to grow in different conditions. I climbed the volcano on April 6th 2017 by the track behind Pertamina geothermal plant. I parked my motorbike at the Rumah Makan at the entrance of a small waterpark and asked for the track. The track starts in an impressive bamboo forest, it’s easy to get lost. But after you find an good track with old stone stairs. It’s very sloping and you have nice views of the valley. The hike is short but intense. It’s an easy and spectacular volcano, still active. Going down, I stopped at the RM and had a good meal and a free hot shower ! That’s a good deal ! we did this gunung yesterday starting from berastagi and then walking down to Raja Berneh Village through the jungle and the bamboo forest. The conditions of the return trail are now very poor. Lack of maintenance has allowed vegetation to invade part of it so that you have to walk half bent for the presence of a vegetable roof. Some short parts of the trail have been eroded away and you must be very careful in finding out the right path. We are afraid that in a few years the path will be difficult or impossible to follow if there is not substantial intervention. Amazingly it turns out that a small number of hikers have reached the true summit (Gunung Pintau) – mainly expeditions by harcore student hikers. I don’t know how long it takes, probably 2 or 3 days as they must have cut the trail to the peak. I’m trying to find out more… for now here’s a picture of the trig at the summit…. I hiked to this volcano in Sept 2, 2011. That was my first experience to hike this volcano. The smell of the sulphur gas often made me had to stop my steps for a while. The views were spectacular, either the way to the top or above the crater. Still above the crater, after I went down from Antenna Peak, I met three guys from Italy. I helped to take few pictures for them, and one of them took two pictures for me too with Antenna Peak as the background. I took many pictures there along the journey and above the crater with my camera, but only two pictures with me inside the picture. At least I’ve got two documentations that may say that I really have ever been there. Thanks to the guys from Italy, hope to see you again someday, somewhere. I’ve had my eye on another trip to North Sumatra for quite a while so I booked a last minute ticket and headed out of Jakarta for Idul Fitri. Brastagi was about as busy as usual when I arrived – a handful of tourists but plenty of rooms still available. I ended up at Wisma Sibayak, a lovely place near the cabbage monument at the turning for the road to Sinabung. Had a lunch at the excellent Raymond Cafe and headed up Gundaling Hill for a view of Sibayak and Sinabung. Geleng, the Brastagi institution himself, showed up and agreed to take me up Sibayak for dawn the following day. I told him I really wanted to try to get to the highest point of the mountain range – a forested peak that looks pretty remote on Google Earth. Next morning, Geleng turned up with an angkot at 3am and we set off up the road. The driver dropped us off halfway up the road which runs almost into the crater itself. By just 4.30 we were on the outer rim of the volcano, listening to the fabulous roar of the fumaroles down by the crater lake. But we were there far too early – first light is not until 6.30. We waited patiently with some Indonesian students who appeared to have spend the entire night slowly working their way up, step by step, presumably stopping every ten minutes for another Pop Mie. We were very lucky with the weather when first light did finally arrive – pretty spectacular scenes as banks of clouds swirled and drifted over what is an amazing volcanic landscape. The top of Sinabung peeped out over the clouds. With regard to the names of the peaks on Sibayak, there seems to be a bit of confusion. In the Wisma Sibayak info guidebook, the ‘top’ is called Batu Marlunglung. Try that in google – no results! The little pyramid peak on the outer rim generally seems to be known as Puncak Antene – the antenna peak – even though there is not actually an antenna there at the moment. The higher peak above the crater lake cliffs is known as Tapal Kuda (horseshoe) or Tapak Kuda (horse’s hoof). We headed up onto the Kuda peak just after first light. From the top you can see the true ‘summit’ of Sibayak which lies about 800 metres further to the northwest. Geleng had never been there nor had he heard of anyone who had been there. It’s remarkably remote and hostile terrain – no trails, deep crevices in the rock, dense vegetation. Perhaps a few of the hikers who never made is back to Brastagi are still over there somewhere. There was also a plane crash here in 1979 – presumably over on the jungle slopes rather than the actual crater area. The Kuda peak is definitely the best viewpoint – and not many hikers climb up this side from the main trail through the crater. We were down at the hot springs in Semangat Gunung in less than 2 hours – the water is a perfect temperature and you get a great view back up the side of the mountain from here. The only trouble is sorting out transport back round to Brastagi – about 13km. The angkots only leave when they’re full (maybe only every 2 hours!) so you’ve basically got to charter one. Rp70,000 isn’t too bad really. I would love to climb this volcano again – it’s just so easy and spectacular if you’re lucky with the weather. The easiest 5-star gunung in Indonesia. the best part is soaking in the hot springs at the bottom.if you are on the way from medan to danau toba then you must do this climb.it only takes a couple of hours up and even less coming back down.if you are looking for a tougher climb try sinabung.you can see it from sibayak and althoguhi havnt done it the locals tell me its not easy.ill take their word for it.